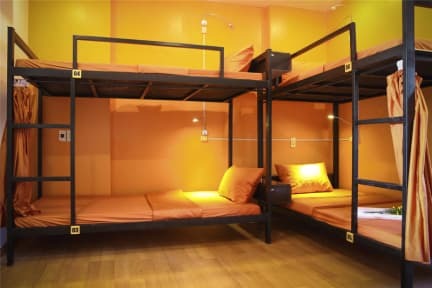 Due to the idea of the bunk bed at the hostel, 4 Seasons Danang Hostel is suitable for all people who prefer the kind of backpacking tourism. 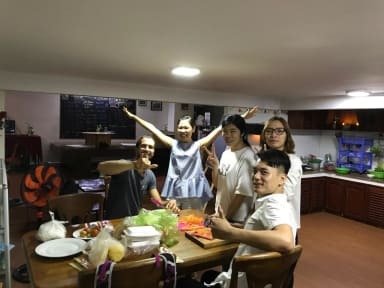 4 Seasons Danang Hostel includes 4 rooms which are symbolic of 4 seasons: Spring, Summer, Autumn, and Winter. Having large windows and separated toiled in each spacious room will make you feel more comfortable. Great staffs, a nice hostel and clean bathrooms. I had a fantastic breakfast as well. 10 minutes to walk to the beach and close to a variery of local restaurants. I really enjoyed my stay. Very good location. Only 15 minute walking to the beach. The staff are very friendly and helpful. The room is clean, quite and private. A lot of restaurants nearby. I absolutely loved staying at 4 Seasons. Ruby and the staff are wonderful. It’s also a great value for your money. Would definitely stay again. A lot of local food nearby, great atmosphere and amazing staff. Beds are rock hard but it’s fine. Hostel is very clean and safe and they have a kitchen you can use ! Breakfast was good nothing special but good and free. Met some really good people here. I wasn’t even staying at this hostel but I spend all my nights there anyway so eventually I moved in. Would def recommend! Host Ruby was absolutely fantastic- welcoming, funny and explained everything about hostel. Room was ok and had curtain for privacy. Cleanliness could have been done better in the dorm as it was a lot of dust under the beds. Breakfast was ok and complimentary tea was basically hot water no taste of it whatsoever. not sure maybe that’s how they make it in Vietnam. I would recommend to stay as it was good location! Overall no problems, nothing exciting good value for money. Staff were exceptionally helpful. WiFi intermittent. Staff is super nice. Location is good but a bit dodgy if you’re arriving in the late evening (also quite hard to find because they close their doors and there’s no sign outside). Beds were rock solid and water in the shower was cold. They rent motorbikes which is a plus. There’s no atmosphere at all, very hard to meet new people which was a huge downside for me as a solo traveler. Honestly it just isn't what the pictures show. Wouldn't stay again though the Spanish speaking guy was nice, the facilities were just way uglier than the pictures. Was not impressed. I have nothing good to say about our stay at 4 seasons hostel. We checked into to our room but were not given a room key because the dorm didn’t even have a lock on it. The lockers that we were given were tiny and one of them didn’t even lock properly. The beds did not have mattresses, but were sun loungers; rock hard. I have several bed bug bites due to the bedding. The bathroom was dirty and the shower cold. The aircon didn’t work at all and the free breakfast was awful. Don’t stay here!! !